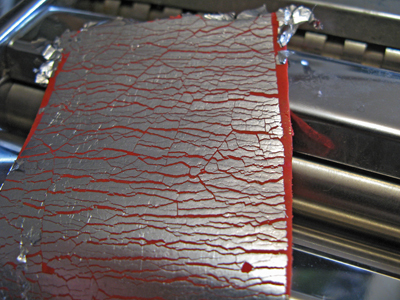 The first step is to condition your polymer clay and roll it out to a sheet 1/8 inch thick and twice the size of your metal object. 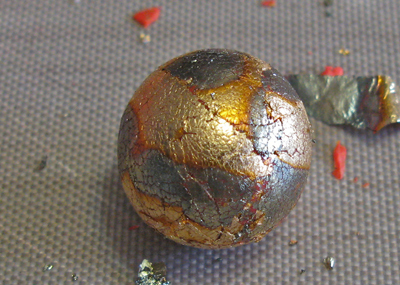 Next bring in the metal leaf and cover the clay completely. 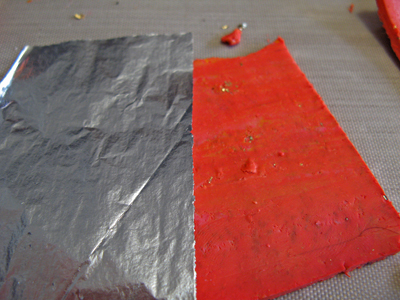 Roll over it with the acrylic roller to fix the metal leaf and the clay together. Use a light touch and try not to stretch the clay. Using the same setting on the pasta machine as you did to roll out the clay to its final thickness, pass the clay through the roller once then narrow the setting one mark and repeat. The clay will stretch and the metal leaf will tear slightly. Now rotate the clay 90 degrees and repeat the last action. 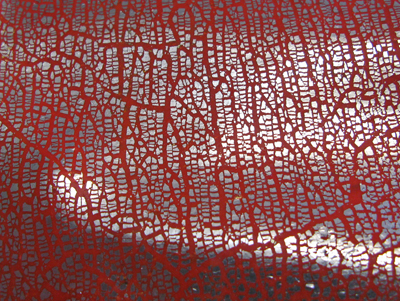 This should stretch the clay once again and give a dried mud look…sort of like the crackle paints will do. 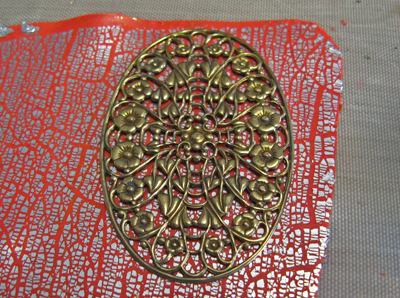 The next step is to place a piece of filigree on the clay and press down with just your fingers. 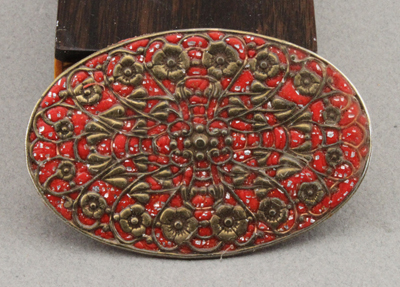 Using a roller evenly force the filigree into the clay. As you do this, watch the clay rise up into the filigree. The clay should protrude a little through the filigree. 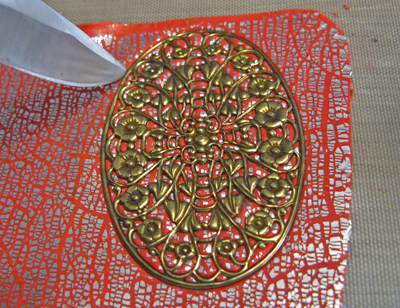 Cut the clay away from the filigree with a sharp knife or tissue blade. 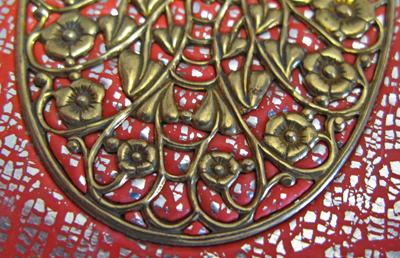 Once the filigree is free from the background lightly press in from the back until you are satisfied with the look. Bake the piece as usual and it’s ready for use. The left overs can find several creative uses. I filled a backless bezel with some and baked it making an attractive base to further fill with Ice Resin. 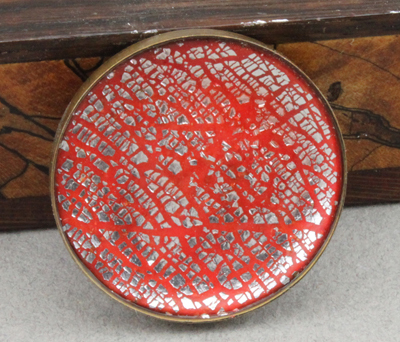 I had several pieces of clay scraps left and made beads which I rolled in some variegated metal leaf. Just wrap it over the clay and roll in your hands. 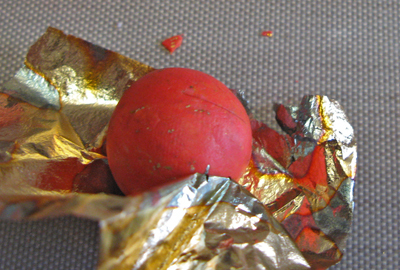 Brush off the remnants and glaze with liquid polymer clay before baking. 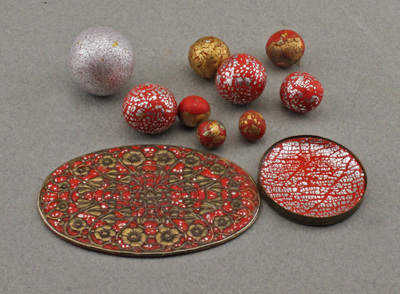 For all of these beads and two metal projects I used about ¾ of a block of clay. The beads I drill after baking. I slightly under bake the clay then overcoat with glaze and bake again. 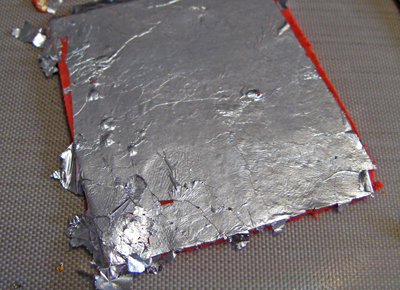 You can also dip it in Ice Resin or other mediums to give the finish you prefer. Harry W Wood earned a BA in fine art then apprenticed as a goldsmith and jewelry repairman working 8 years in a corporate shop. After 30 years creating and displaying sculptures, photos, and paintings in juried exhibitions he returned to jewelry design and opened Oscarcrow at etsy.com. I try to learn something new every day and create at least one new object each day. Rings are my main design form and examples of all my creations can be found at www.oscarcrow.etsy.com Visit www.oscarcrow.etsy.com for further discussions on specific issues in metalworking and bench work.